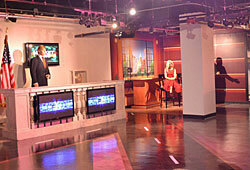 Madame Tussauds Wax Museum in New York - see celebrities made of wax - buy tickets online. For those of you who like to see movie stars, politicians, sports stars, presidents and other celebrities, make a visit to Madame Taussauds in New York. The museum opened in 2000 in Times Square. 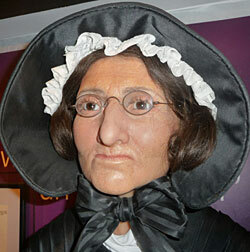 Marie Tussaud was born December 1, 1761 in Strasbourg (born Anna Maria Grosholtz) and died April 16, 1850 in London. She learned to create wax dolls from a doctor named Philippe Curtis. It was Mary's mother who worked as a housekeeper at the doctor when Marie was little. Phillipe made dolls of wax to illustrate anatomy. Philippe started later on a wax museum in Paris and Marie learned more and more the art of creating wax dolls. Marie worked for a time as an art dealer to Madame Elisabeth, who was King Loius XVI sister. During the nine years she lived in the castle in Versailles. At the French Revolution of 1789 Marie ended up in prison then Philippe sympathized with those who stormed the Bastille. Marie was sentenced to death but pardoned and then got to show what she went for: she would depict those who had been executed. When Philippe die in 1794, Marie inherits all the wax dolls. Over time, marries Marie and has two sons. She takes a son and her wax dolls and move to London in 1802. Before she decides to get a place for their wax dolls, she travels around in over 33 years to different places with the dolls. Six years before her death in 1850, she depicts herself as a wax figure. The legacy of the museum goes to her two children. Today the museum is managed by "The Merlin Entertainments Group". Visit Madame Tussauds in Times Square. 5 floors with about 200 wax figures. See Lionel Messi, Ed Sheeran, Pharrell Will Liam, Jimmy Fallon, Pink, The Model Adriana Limam N.A., Jennifer Aniston, etc. You will also experience the fantastic CINEMA 4D salon with 3D technology. Visit the "Music Zone" and perform with the hottest artists, or "Sports Zone" where you can challenge Evander Holyfield and experience scenes and moments in "The Spirit of New York". 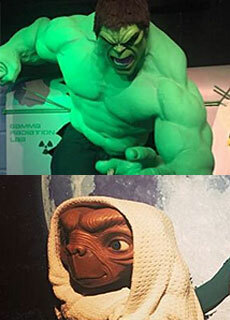 Also meet superheroes like the Hulk, Thor, Iron Man and Captain America in Marvel Super Heroes 4D. New for 2016 is also THE GHOSTBUSTERS EXPERIENCE where you get to meet the characters in the new production of the film Ghostbusters when they hunt ghosts in New York. You will be able to get to know how it is to be a Ghostbusters when adding a ticket for Ghostbusters: DIMENSION. SAVE UP TO 20% ON TICKET PRICE WHEN BUYING ONLINE! Open all year round, even during Christmas and New Year with slightly shorter opening hours. Ticket info: When you buy your ticket you book a date and entry time. The ticket you can get as an e-ticket to print out and take with you or through your mobile phone that you just show up. With your pre-purchased ticket you will not have to stand for tickets, you can go straight to the entrance. 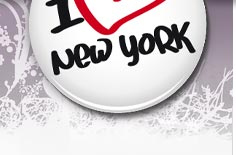 NEW YORK AND MADAME TUSSAUDS! You can take a picture of yourself together with the Hulk, E. T. Indiana Jones, Rihanna, Selena Gomez, Marilyn Monroe, Bruce Willis, etc. Take a trip down memory lane among music and pop stars such as Frank Sinatra, Billie Holiday, Bob Marley, Withney Houston, Tina Turner, Michael Jackson, Jenna Marbles, Lady Gaga, Selena Gomez, Diddy, etc. When it comes to sports, shoot yourself with Eli Manning, Lionel Messi, Michelle Kwan, David Wright, Carmelo Anthony Serena Williams etc. Do not miss the movie stars Scarlett Johansson, Johnny Depp, Denzel Washington etc.